사수님이 보라고 주셨다. NLP를 위한 fine-tuning. transfer learning은 computer vision 연구에 큰 영향을 끼쳤다. object detection, classification, segmentation 등등 fine-tuned model을 안 쓰는게 거의 없다. NLP task에서는 지금까지 transfer learning이 CV에서만큼 성공적이지 못했는데, 그 이유를 보자면. CV에 비하면 NLP 모델들은 얕고 task마다 1차적인 word embedding을 제외하면 공통적으로 사용될만한게 별로 없다. 우리가 해결방법을 잘 알지 못했다. 그래서 이분들이 등장했다. Universal Language Model Fine-tuning (ULMFiT) 으로 정복하고 구원. Universal Language Model Fine-tuning (ULMFiT) 방법을 제시하여 Vision 쪽에서의 transfer learning과 같은 효과를 NLP task에서 보일 수 있게 했다. 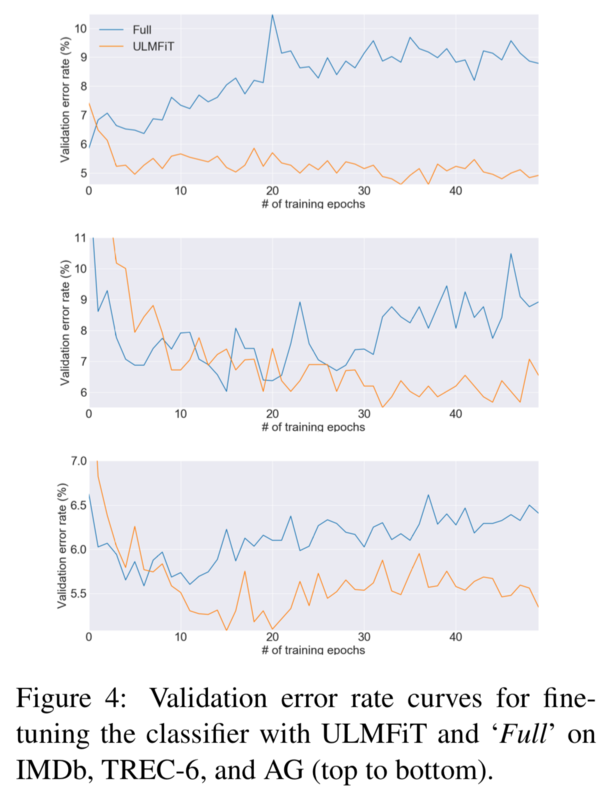 fine-tuning을 위한 discriminative fine-tuning, slanted triangular learning rates, gradual unfreezing, 세 가지 새로운 효율적인 technique을 제시했다. pretrained model들이 다른 곳에도 잘 쓰일 수 있게 했다. general to task-specific transition으로 말할 수 있다. 단순히 더 설명하자면, 주어진 task에 대하여 잘 학습된 모델이 필요할 때, 현재 task보다 더 general한 목적 하에 학습된 모델을 가지고 학습을 시작하는 것이다. 여러 NLP task에서도 pre-trained word2vec을 사용하는 경우들과 같다. 다만 이 경우는 1st layer만 transfer된다고 볼 수 있다. 원래는 CV에서도 모델의 1st layer만 학습된 feature들을 갖다 썼는데 요즘에는 여러 개를 fine-tuning하여 갖다 쓰거나 뒤쪽 layer들도 학습된 걸로 가져다가 쓴다. 다른 종류에 task에서 pre-trained된 embedding을 사용하는 것. CV 쪽에서는 hypercolumn이 end-to-end fine-tuning한테 져서 거의 안 쓴다. main task model에 다른 language modeling objective를 결합해서 학습시키는 것. (ex. 기계번역 model에 syntactic parsing 기능을 넣어 놓고 objective function을 잘 짜기) 얘네는 pre-trained된 걸 쓰는 건 아니고 매번 scratch부터 다시 학습된다. objective function을 디자인할 때 좀 힘듬. pre-trained된 모델을 가져다가 쓸 때 목적이 다르다해도, 비슷해서 약간 변화시켜서 현재 task를 위해 사용할 수 있을 때, 그 모델을 변화시키고 필요한 부분은 (정교하게) training 시키는 것을 말한다. 예를 들어, (개, 고양이) 두 개의 카테고리로 사진을 분류해야 한다고 치자. VGG16 모델이 사진을 1000개의 카테고리로 분류하게 학습되어 있다면 그걸 가지고 와서 bottleneck feature가 나오는 부분에서 짤라서 거기다가 affine layer 하나 장착시켜서 그 부분만 학습시키면 목적에 맞는 모델을 만들 수 있다. NLP에서도 QA에 이용한다던가, distantly supervised sentiment analysis에 이용한다던가 해봤지만 관계가 직접적으로 없는 모델에서는 실패하며, language model을 fine-tuning하여 좋은 성능을 내려면 수백만 개 이상의 document가 필요하다. 하지만 본 논문의 ULMFiT은 다 해결하고 small dataset으로 state-of-the-art 달성함. Language modeling은 NLP task의 가장 기본적은 source task이다. 본 논문에서는 pre-trained된 language model을 classification에 맞춰 fine-tuning한다. language modeling을 학습시키면서 특정한 또 다른 task, syntactic dependency처럼 특정 feature에 sensitive하게 모델을 짤 수도 있겠지만 그 부분은 future work로 열어두었다. 모델은 위와 같다. 3-layer LSTM으로 되어 있고, 1) 먼저 general-domain corpus에 맞추어 pre-train되고, 2) 전체 language model이 target task를 위해 주어진 data에 맞추어 discriminative fine-tuning과 slanted triangular learning rates를 이용하여 fine-tuning되고, 3) classifier가 gradual unfreezing, discriminative fine-tuning, slanted triangular learning rates를 이용하며 fine-tuning된다. 여기서 language modeling을 위해서는 기본적으로 당시 state-of-the-art인 AWD-LSTM을 사용한다. Wikitext-103 데이터 위에서 pre-train한다. 가장 오래 걸리지만 한 번하면 다시 안 해도 된다. 이제 pretrained general-domain LM이 주어진 상태이다. 그대로 가져다가 target task의 data에서 학습시키는데, 여기서 discriminative fine-tuning, slanted triangular learning rates 두 가지 새로운 테크닉이 있다. Yosinski et al., 2014에 의하면 각각의 layer가 서로 다른 type의 정보를 가진다고 한다. 그러므로 각 layer마다 서로 다른 learning rate를 적용한다. 저자는 실험적으로 마지막 layer의 learning rate를 정하고 1칸씩 앞으로 갈수록 learning rate가 2.6으로 나눈 값으로 설정하는 것이 성능이 좋다고 했다. 빠르고 효율적으로 gradient descent가 이루어지려면 learning rate의 in-train 조절이 필요한데, 여기서는 위 그래프와 같이 변화시킨다. 이것이 slanted triangular learning rates (STLR)이다. 이제 classifier에 맞추어 fine-tuning을 해야 한다. linear layer 두 개를 더 붙이고 마지막 softmax로 target class들에 해당하는 확률이 나오도록 한다. hidden state를 뽑아 올 때 중요 정보를 잃을 수 있다. 그러므로 위 계산처럼 각 time step의 hidden state를 concatenate한 H를 max-pool한 값과 min-pool한 값을 h와 concatenate하여 보내 준다. 모든 layer를 함께 fine-tuning하기보다, 다 얼려놓고 last layer부터 천천히 unfreeze한다. Language model 학습에는 large input sequence에 유리한 Backpropagation through time (BPTT)을 이용한다. 모든 실험에서 forward LM, backward LM 둘 다 학습시키고 fine-tuning에서도 각 LM에서 BPT3C을 따로 쓰고 classifier prediction도 따로 구해 평균낸다. CoVe (McCann et al., 2017) 얘가 당시 state-of-the-art transfer learning method 였단다. IMDb와 AG 데이터셋이서는 supervised ULMFiT가 example 100개만 가지고서도 10배 20배의 데이터로 scratch부터 학습된 모델만큼의 성능을 낸다. general-domain LM pretraining이 빛을 발하는 순간이다. 작은 데이터셋으로도 좋은 성능을 얻을 수 있다. 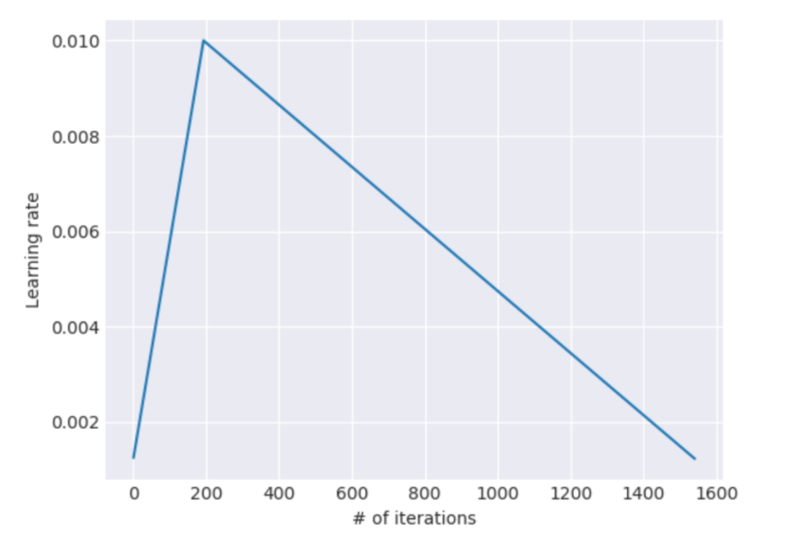 여기에 unlabeled example (50k for IMDb, 100k for AG)를 semi-supervised learning에 사용할 수 있다면 50배 100배 많은 데이터셋을 가진 scratch부터의 모델의 성능을 낼 수 있다. pretraining이 작은 데이터셋에서 강점을 가졌지만 Table 4를 보면 큰 데이터셋에서도 성능 향상을 가진다. LM을 좋은 걸 쓰면 이만큼 성능이 향상된다. 특히 데이터셋 크기가 작을 때는 더 중요하다. 어떤 환경에서 뭐가 더 좋았고 어떻고 하는데 좀 길어서 본문 보는게 좋다. 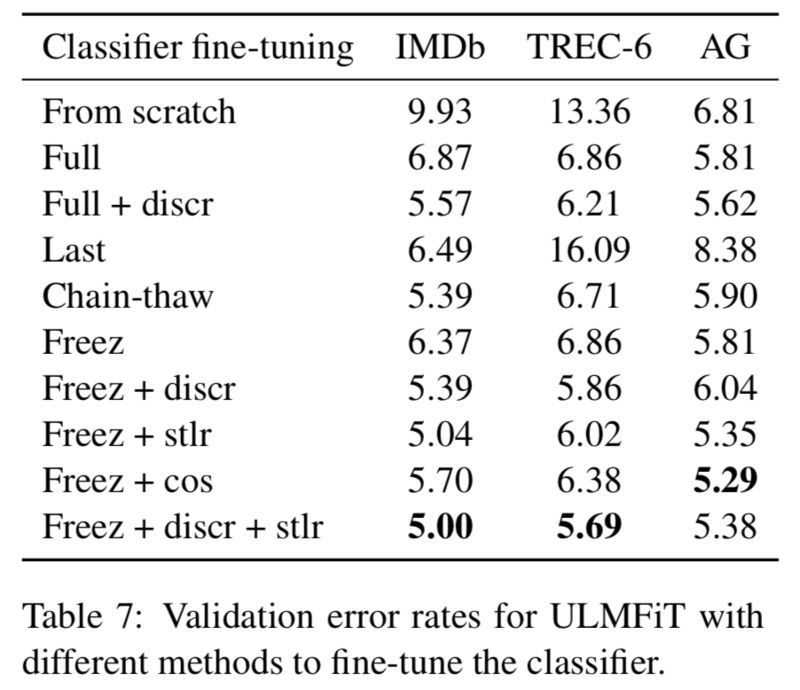 아까 Target task classifier fine-tuning 에서 이것저것 테크닉을 써줬는데 그런거 안하고 그냥 다 한꺼번에 학습시키면 저렇게 성능이 안 좋다. bidirectionality를 이용해서 forward LM, backward LM의 결과를 평균내는 편이 성능을 0.5-0.7은 상향시킨다. 영어가 아니면 데이터셋이 상당히 부족한데 이 연구가 많이 도움될 것이다. labeled data가 별로 없는 경우도 연구가 많이 도움될 것이다. language modeling이 multi-task learning이나 다른 feature를 직접적으로 포착하게 하면 도움이 될 수 있다. classification이 아닌 다른 task에 적용시켜볼 수 있다. We have proposed ULMFiT, an effective and extremely sample-efficient transfer learning method that can be applied to any NLP task. We have also proposed several novel fine-tuning techniques that in conjunction prevent catastrophic forgetting and enable robust learning across a diverse range of tasks. 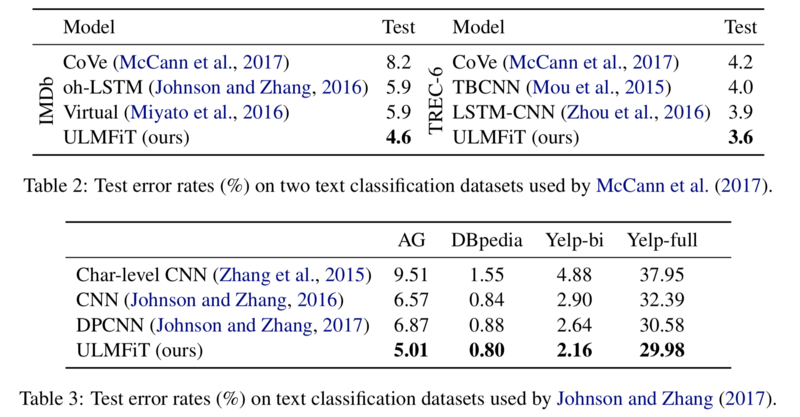 Our method significantly outperformed existing transfer learning techniques and the state-of-the-art on six representative text classification tasks. We hope that our results will catalyze new developments in transfer learning for NLP.